In our last post, we jumped ahead to Tasting 4 (Chinese Black Teas) of the Harney tasting in SoHo. In this post, I present my notes on Tasting 2: Green Teas from China and Japan. We were served two Chinese greens (Mejiawu Lung Ching (aka Dragonwell) and Gunpowder) and three Japanese greens (Scent of Mountain Sencha, Bancha, and ceremonial-grade Matcha). As expected, the wet leaves of the Dragonwell exuded sweetness. The liquor tasted of asparagus and as the tea cooled, it became astringent. 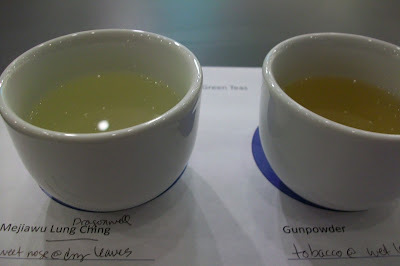 Harney's tasting notes described the Gunpowder's aroma as "steamed bok choy & toasted walnuts." I smelled tobacco and tasted dirt. The woman to my left tasted spinach. 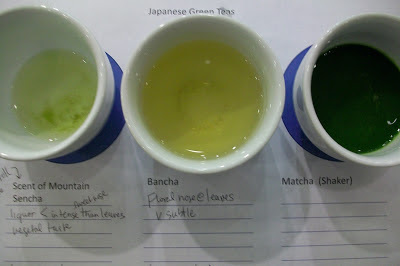 Turning to the Japanese greens, we were served a Sencha, a Bancha, and a ceremonial-grade Matcha. Also, each participant was served a plate of tea treats. 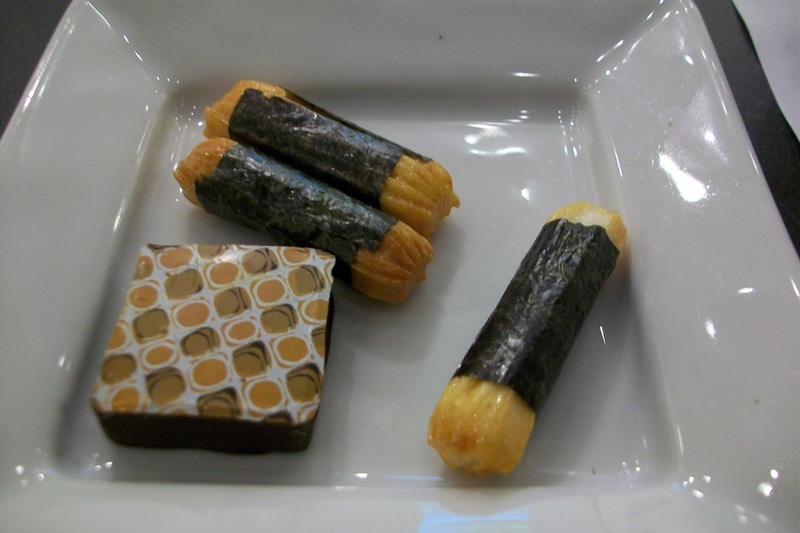 Nori roll snacks were paired with the Sencha and Bancha. The Sencha's liquor was less intense than the sweet nose of its leaves. The nori snacks complemented this tea as well as the light lemon flavor of the Bancha. My favorite of the Japanese green teas was the Matcha which was served shaken and chilled. The Matcha was bitter so the dark chocolate square from Mariebelle Sweets (on Broome Street) was a perfect pairing! 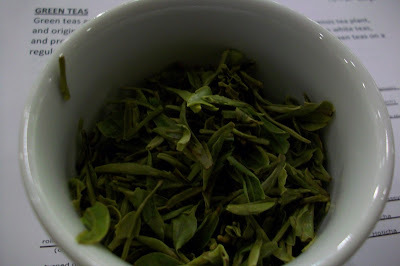 Previous posts in this series include one about white teas and another about Chinese black teas. Stay tuned for posts about Oolong Teas (Tasting 3) and British Legacy Teas (Tasting 4, part 2).